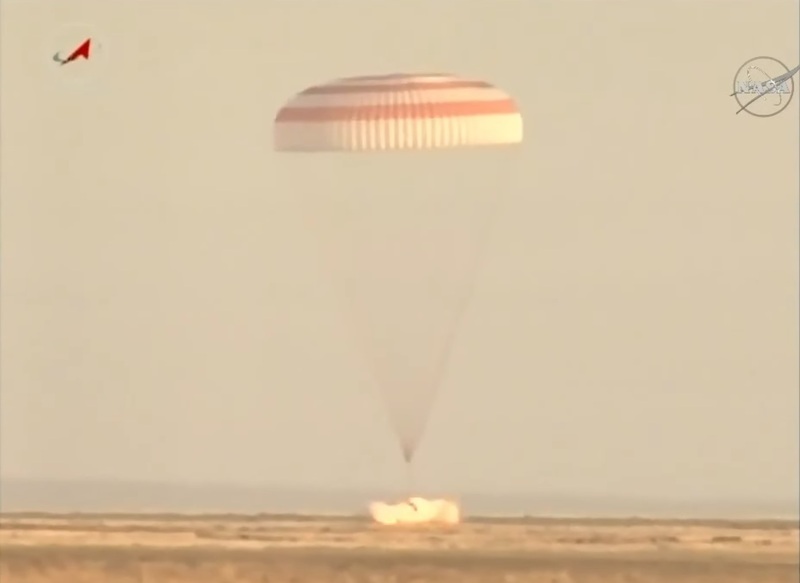 A five-time space flier, a test-pilot-turned-astronaut and a NASA record holder parachuted into the sunrise on Sunday, safely touching down in the Kazakh steppe via a rocket-cushioned landing maneuver aboard their Soyuz MS-04 spacecraft. 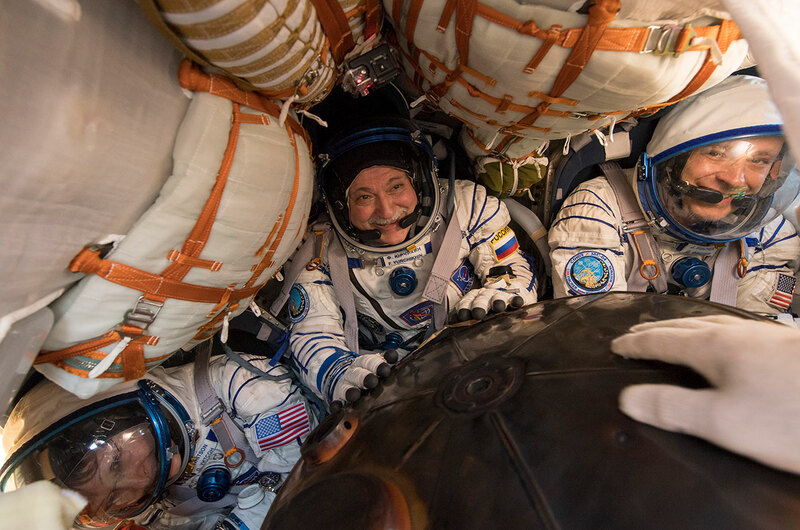 The Soyuz – christened “Argo” by its crew – carried Russian Cosmonaut Fyodor Yurchikhin and NASA astronauts Jack Fischer and Peggy Whitson who returned to the planet after a record-setting mission. 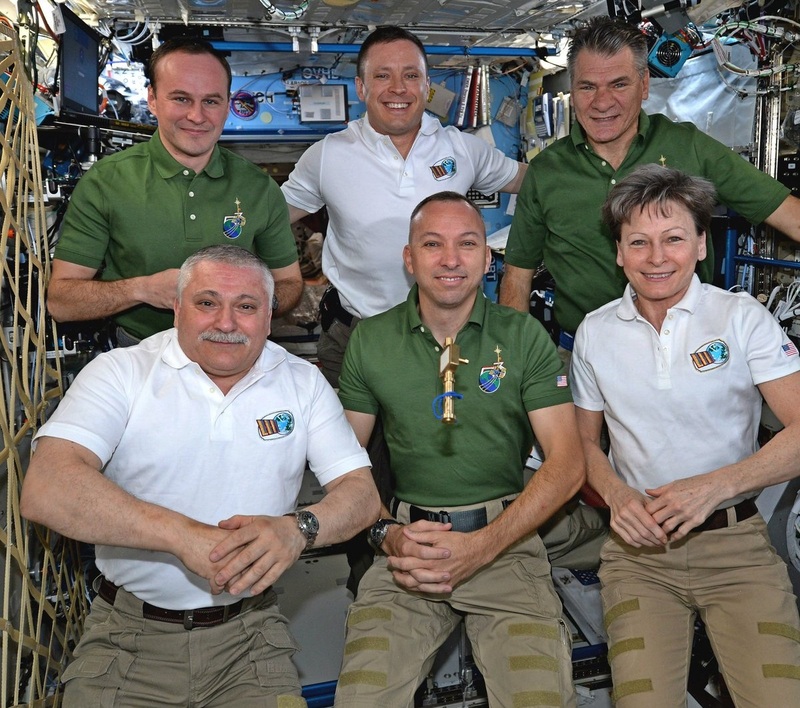 Poised for a landing just after sun-up, the three departing crew members sealed themselves off aboard their Soyuz at 18:41 UTC on Saturday, bidding farewell to the Expedition 53 crew that will have ISS to themselves for the next 11 days. Soyuz MS-04 pushed off from the orbiting laboratory at 21:58 UTC and fired its engines to open a gap to the complex for the rocket-powered deorbit burn two and a half hours later – placing the craft on an arc intercepting Earth’s atmosphere. 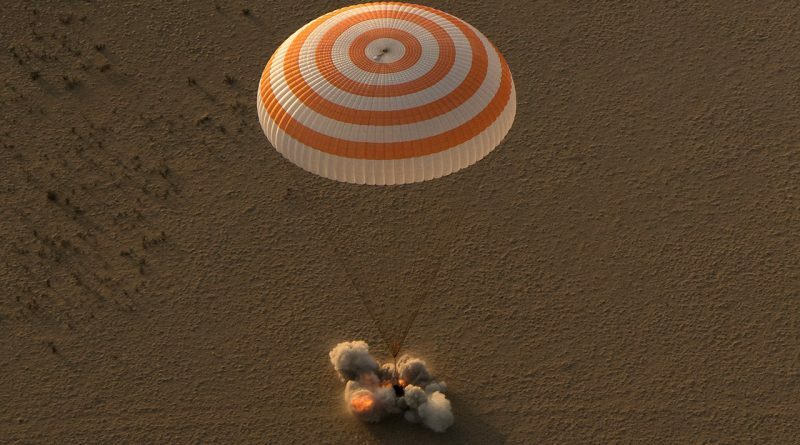 Soyuz split into three as it crossed the Red Sea and the Entry Module hit the dense atmosphere when it dipped below 100 Kilometers in altitude over northern Iraq, approaching its landing site from the south west. Barreling through the atmosphere, Soyuz began the process of slowing down from a mind-boggling speed of 7.6 Kilometers per second to a complete halt in just 23 minutes – giving the crew quite a ride & pulling over 4Gs on the way down. Soyuz emerged from the plasma of re-entry and opened its huge orange-and-white main chute to bring the craft into a vertical descent to the landing site, gearing up for the main event of the morning’s landing. Soyuz fired braking rockets just before making contact with Terra Firma in an effort to cushion its impact, coming to rest on its side at 1:21 UTC, 7:21 a.m. local time in the planned landing area south east of the remote town of Dzhezkazgan – marking the end of a 136-day mission for Yurchikhin and Fischer and the return of Peggy Whitson after 289 days off the planet. Third-time Soyuz Commander Fyodor Yurchikhin and NASA rookie Jack Fischer launched as a two-man crew on April 20 after Russia decided last November to cut its permanent ISS crew from three to only two members. As a result, the right seat on the Soyuz was filled with a cargo container on the way up, but it offered the opportunity of moving Peggy Whitson from the Soyuz MS-03 spacecraft to keep an additional pair of hands on ISS to help deal with a very busy science schedule over the summer and avoid a lengthy period of two-crew operations in June/July due to an upset to the Soyuz flight schedule caused by technical trouble earlier in the year. 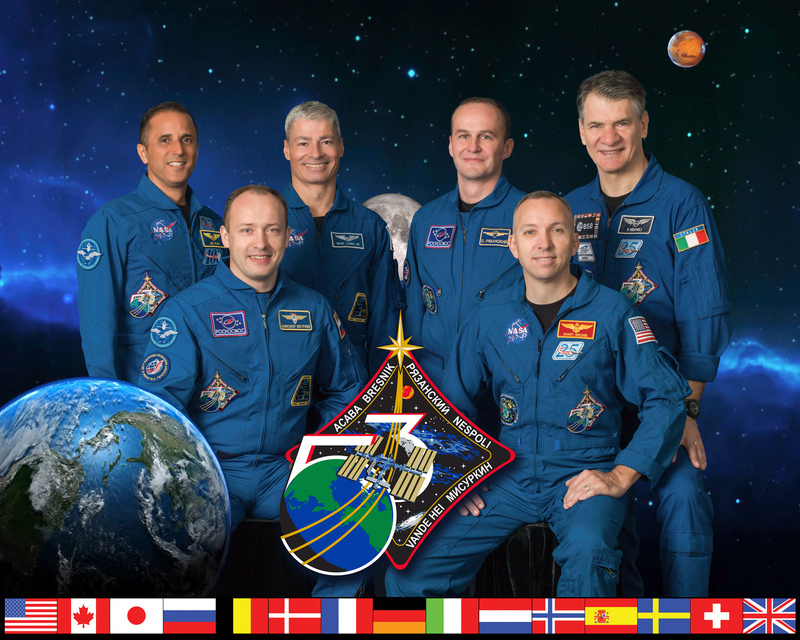 Transitioning to the Soyuz MS-04 crew, Peggy Whitson was looking at a nine-and-a-half-month mission duration – the second-longest flight in ISS history after the year-long Expedition by Scott Kelly and Mikhail Kornienko for which Whitson actually had been in the running, making her a perfect candidate for an extended mission. Starting her third stint aboard ISS on November 19, 2016 after a two-day Soyuz flight, Peggy Whitson saw the Station at its busiest – seeing nine visiting vehicle arrivals and departures, conducting hundreds of scientific experiments in all fields of science, and supporting seven spacewalks as part of continuing efforts to ready the complex for the start of Commercial Crew missions and revamp the Station’s systems to keep it running at full capacity heading into its last decade of operations. 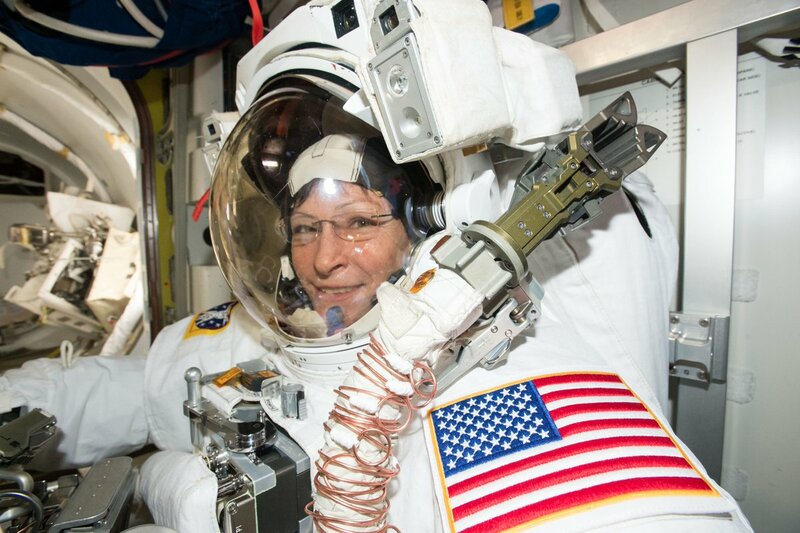 Peggy Whitson became NASA’s most experienced Astronaut on April 24 when she passed Jeff Williams for career time spent in space and by the 200-day mark, she had surpassed Samantha Cristoforetti’s record for the longest space flight by a woman. Adding 289 days and five hours to her career total, Whitson now stands at 665 days and 23 hours spent in space on three long-duration ISS missions – ranking eighth on the all-time list behind seven Russian colleagues including her crew mate Fyodor Yurchikhin who is in seventh with 673 days. Highlights of Peggy Whitson’s flight included four spacewalks – performed in an extensive robotic-and-human collaboration at the start of the year to install a new batch of batteries on the Station followed by EVAs performed in support of the relocation of Pressurized Mating Adapter 3 to a position where it can welcome arriving Starliner and Dragon spacecraft. Adding four excursions to her record, Whitson now stands at ten career EVAs for a total of 60 hours and 21 minutes, making her the third most experienced spacewalker in history, beating Yurchikhin on this particular record list who is in fourth position for cumulative EVA time, recently adding the ninth spacewalk to his record. Over the course of her mission, Peggy Whitson circled the Earth 4,623 times and covered 196 million Kilometers. Soyuz MS-04 and its original two crewmen had a shorter flight of 2,176 orbits and close to 93 million Kilometers. Gearing up for a busy Saturday night, the ISS crew had some time to rest up early in the day before entering final preparations for the Soyuz departure, notably placing the last return items on the vehicle including a number of science experiments and samples destined for a quick return to Earth. Soyuz MS-04 was powered up for a last round of checkouts, building on testing performed in August to award the vehicle a clean bill of health for its return to Earth. Bidding farewell to their crewmates and their home in space, the Soyuz trio floated aboard their spacecraft – Fyodor Yurchikhin gave his home in space for nearly two years of his life a loving tap as he floated into the Soyuz, likely departing ISS for the final time. He closed the hatch of his ‘Argo’ at 18:41 UTC followed two minutes later by Sergei Ryazanskiy closing the hatch of the Poisk module, marking the crew’s separation after five weeks of six-crew operations as part of ISS Expedition 52. Sealed off aboard their spacecraft, the crew began a two-hour process of checking for leaks, moving Soyuz to autonomous power, transitioning from hard-line to radio communications and donning their Sokol Launch and Entry Suits – the crew’s last line of defence in case of a depressurization on the way down. Making his third return as Soyuz commander, Fyodor Yurchikhin entered the center seat inside the small Entry Module with Flight Engineer #1 Jack Fischer to the left and Peggy Whitson subbing-in for the cargo container that rode uphill in the module’s right seat. 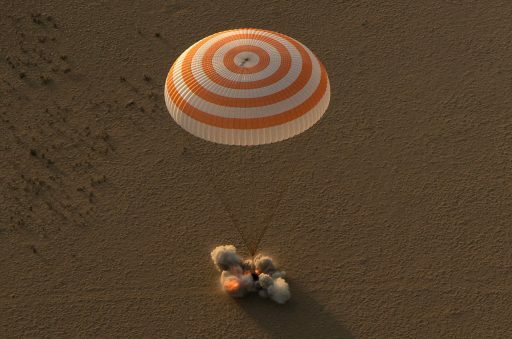 They then went through a leak check on the Entry Module and their suits before preparing the vehicle’s flight control system for undocking, also receiving the latest trajectory computation for their blazing return to Earth. Hooks started driving open at 21:56:30 UTC and loaded springs pushed the spacecraft away 90 seconds later, marking the start of the crew’s three-and-a-half-hour return journey. 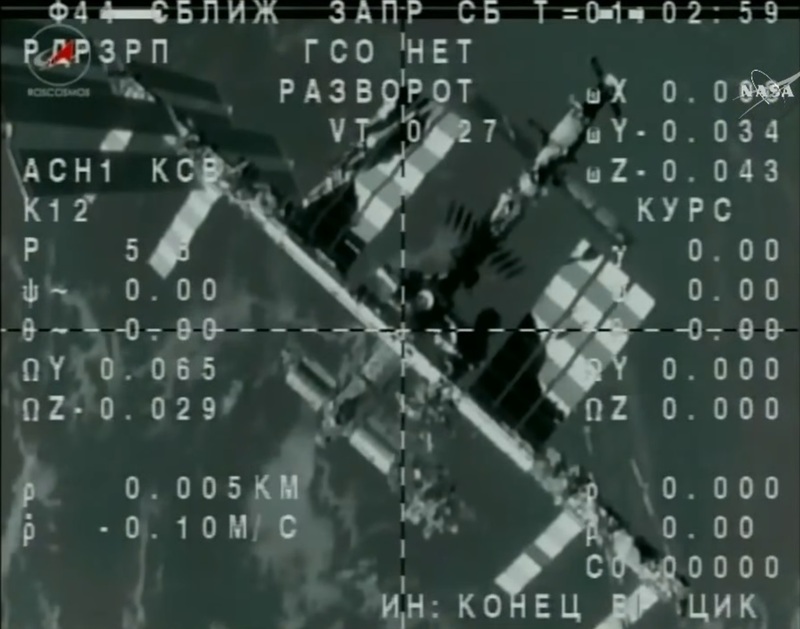 Pushing off the much heavier ISS some 400 Kilometers above Mongolia, Soyuz drifted away from Poisk for three minutes before firing up its DPO thrusters – first for an eight-second, 0.54m/s departure burn along the radial vector to increase its opening rate and a second burn of 15 seconds occurred one and a half minutes later to accelerate the Soyuz along the velocity vector, setting up a typical V-bar departure path without having ISS pitch-up by 90 degrees. 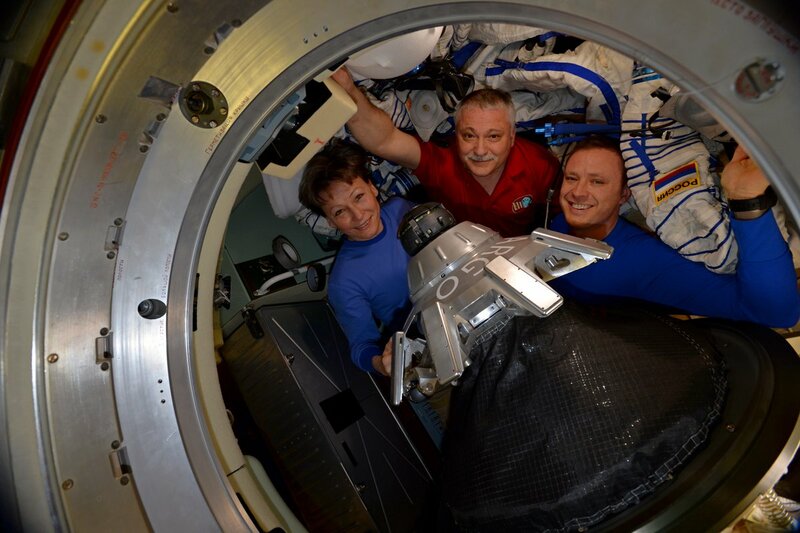 The crew then settled down inside the ‘cozy’ Entry Module for the next lap around the planet before beginning the multi-step process of preparing Soyuz for its fiery return to Earth. Having re-oriented to a tail-first attitude, Soyuz ignited its SKD main propulsion system at precisely 0:28:54 UTC to hit the brakes and place the spacecraft onto a sub-orbital arc intersecting Earth’s atmosphere at a pre-determined location. Firing for four minutes and 39 seconds, the 300-Kilogram force S5.80 main engine slowed the seven-metric-ton spacecraft down by 128 meters per second – just enough to drop it out of orbit. Descending toward the atmosphere, Soyuz accelerated to a speed of 7.6 Kilometers per second while the crew closed their helmets in preparation for the separation of the Soyuz modules, also preceded by the depressurization of the Orbital Module. Still immersed in orbital night, Soyuz fired a series of pyrotechnics at 0:56:16 UTC when passing 140 Kilometers in altitude to split in three parts with the Orbital & Service Modules set for a destructive re-entry while the Entry Module oriented its heat shield toward the direction of travel to be ready for entry. The 2.2 by 2.17-meter Entry Module passed over Baghdad and hit the atmosphere moments later while flying over northern Iraq when crossing 100 Kilometers in altitude. 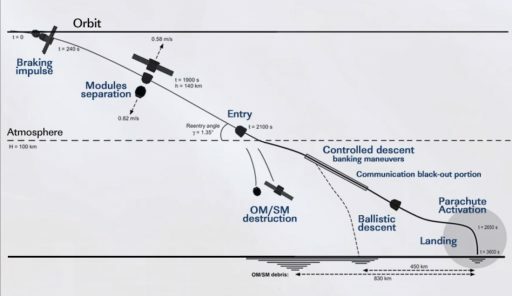 Soyuz held a pre-programmed orientation for the first 92 seconds of re-entry before enabling active guidance – going through a series of bank maneuvers to bleed off energy and modifying lift to adjust its downrange travel distance to reach the planned parachute opening point. Slamming into the dense layers of the atmosphere, Soyuz relied on its ablative heat shield to slowly burn away and create a boundary between the extremely hot layer of compressed air in front of the capsule traveling at hypersonic speed. Temperatures on the heat shield reached 1,600°C and the windows started glowing bright yellow while the Soyuz was immersed in plasma, creating a lengthy drop out in communications between the crew and Mission Control. Rapidly decelerating, Soyuz and its crew pulled a maximum of 4.2Gs when the craft was emerging from the plasma of re-entry some 35 Kilometers above the Caspian Sea, continuing on a north-easterly heading toward the landing site. 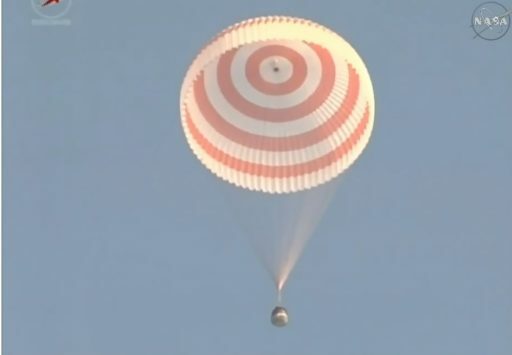 Communications dropped out before re-entry and all were relieved when Soyuz Commander Yurchikhin, flying under the call sign Olimp, checked in with command aircraft circling the landing site to report everything had gone according to plan for the re-entry. Passing through 10.7 Kilometers, Soyuz blew its parachute cover and mortars ejected two Pilot Chutes that, upon inflation, pulled out the Drogue Chute – a sequence occurring while Soyuz traveled 0.7 times the speed of sound. For the crew, parachute deployment is one of the most violent events because Soyuz gyrates under the chute for about half a minute before its descent stabilizes. 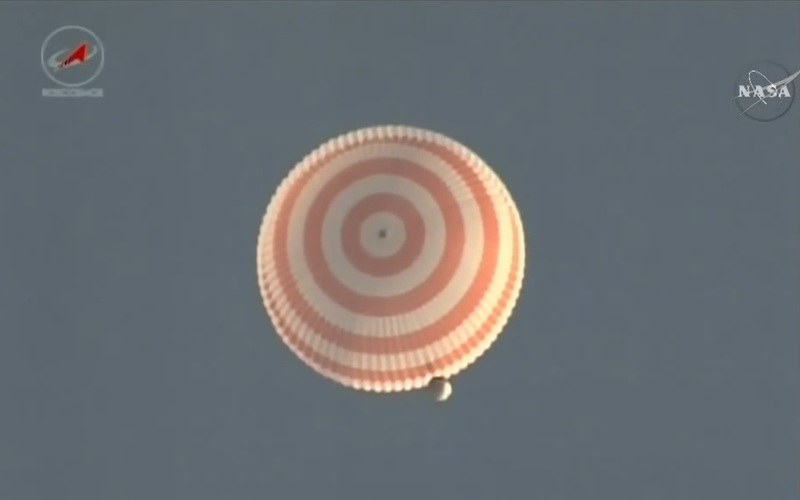 Facing the rising sun, Soyuz slowed to 80 meters per second under the drogue and deployed its large main chute when passing 7.5 Kilometers in altitude to transition into a vertical descent. 5.5 Kilometers above the Kazakh steppe, Soyuz initiated its landing program – dropping the heat shield, venting its propellant tanks and equalizing the cabin pressure before lifting the three crew seats up for shock-absorbing purposes upon landing. Relying on its gamma-ray altimeter, Soyuz blasted its solid-fueled Soft Landing Engines split seconds before touchdown, kicking up plenty of dust as the spacecraft cushioned its impact. Touchdown occurred at 1:21 UTC, 7:21 a.m. local time at the planned location 148 Kilometers south east of the town of Dzezhkazagan, capping a flight of 135 days, 18 hours and 8 minutes for the Soyuz MS-04 spacecraft and its original two crew members and 289 days, five hours and five minutes for Peggy Whitson. 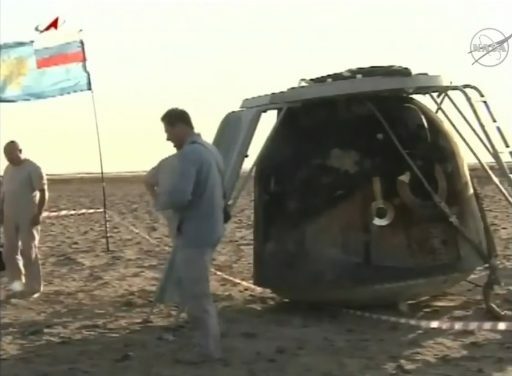 Recovery personnel from Roscosmos, Soyuz-builder RSC Energia and the Rosaviatsia specialists were extremely quick to arrive at the landing site and established radio communications with the crew before opening the hatch. 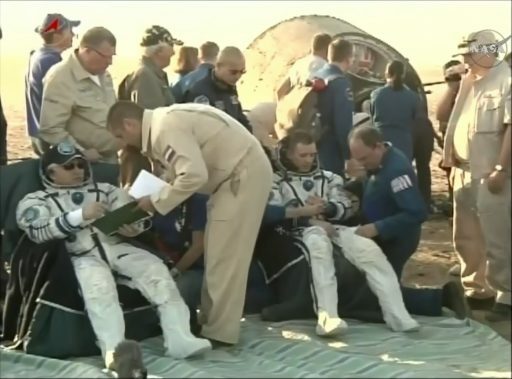 All three crew members were extracted from the capsule in good physical condition, appearing in good spirits as they were sat in reclining chairs next to their spacecraft to enjoy a breath of fresh air and the warming rays of the rising sun on what was shaping up to be a nice late summer day in the Kazakh steppe with temperatures already over 25°C when the crew landed. 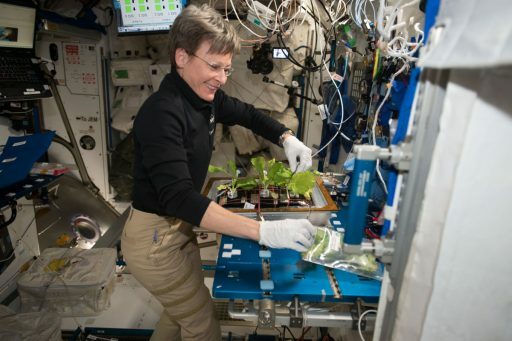 Peggy Whitson appeared in remarkable shape following her return from orbit after nine and a half months – a testament to new developments in the area of countermeasures to space-induced bone and muscle loss which are a major objective in research carried out aboard the Space Station. 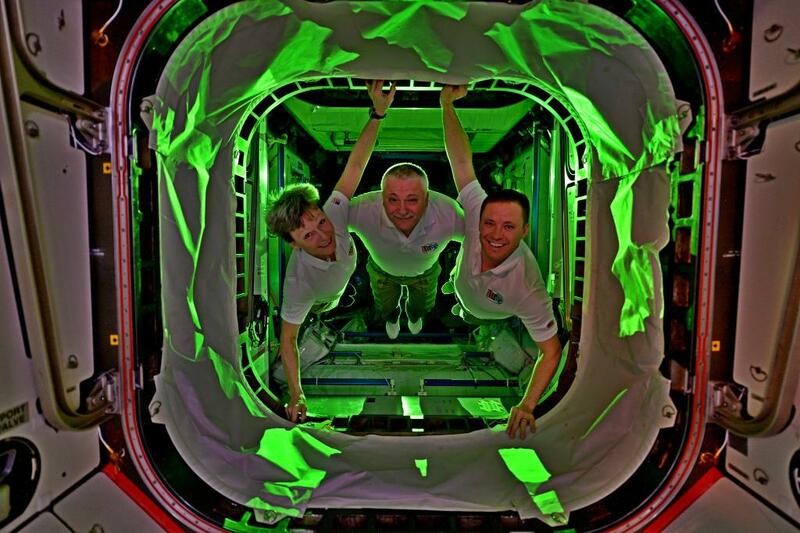 With her mission being around 35% longer than a usual ISS Expedition, Whitson will be subject to a number of tests to see how longer exposure to space – beyond the half-year threshold of ISS missions – affects the human body. Also present at the landing site was a detachment of NASA personnel from the agency headquarters and the Star City office, tending to Peggy Whitson and Jack Fischer after landing. Their return to the Johnson Space Center will look slightly different than the norm due to the NASA plane being late to depart the city of Houston as a result of devastating Hurricane Harvey that caused a major disruption to Johnson Space Center Operations. To get Whitson and Fischer back to their home base, the European Space Agency has chimed in and flew their plane to Kazakhstan to pick up the two astronauts and NASA support personnel and fly them to Cologne, Germany where the NASA Gulfstream jet touched down around midnight, local time. This enables the astronauts and any science payloads to return on the normal schedule, causing no lost science. At the Johnson Space Center, critical flight operations were kept up throughout the hurricane with a skeleton Mission Control Team hunkering down at the control center and efforts are underway to restore non-mission critical infrastructure. 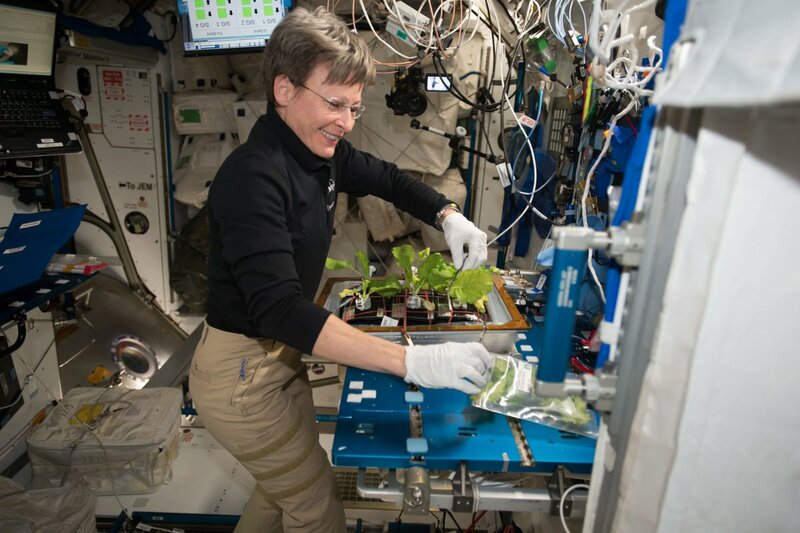 Equipment was being readied starting Wednesday to ensure Whitson and Fischer can receive the standard post-flight care and complete various experiments to study their re-adaptation to gravity after an extended stay in space. At the Baikonur Cosmodrome, preparations are already underway for the launch of the next Soyuz crew of Commander Aleksandr Misurkin and NASA Flight Engineers Mark Vande Hei and Joe Acaba. With liftoff scheduled for September 12, Soyuz has been fueled for flight and is in the process of preparing for integration with the launch vehicle. The three crew members are finishing up pre-flight exams in Star City where they will likely cross paths with Fyodor Yurchikhin after he returns later in the day on Sunday.